There are no records for this musher during the 2019 race. 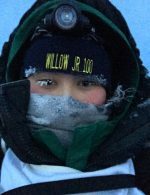 Siera Bobby, 15, has lived in Lime Village, Alaska, since she was 5. She is home schooled and is in the 9th grade. Her grandpa started raising dogs when he came to Alaska. When he came, the only mode of transportation was dog team. She says, “My grandpa taught me everything about running and taking care of dogs. She is running a team from Snow Hook Kennel and has spent two years with those dogs. She says, “Running dog races is very important to me. Not many people from my village run dogs and I would like to bring back something to the other village kids.” She lives in a home on top of a hill that is along a creek that flows into the Stony River and says that words cannot describe how beautiful it is. Siera enjoys sewing, crocheting, drawing and reading. After high school, she wants to get into law enforcement and be a vet tech and says “yes very much so” when asked if she planned to continue mushing.